Curt Swan & Bob Oksner : Superman 303 pg 1 Splash. I realize that this can be very expensive, and I can only apologize for that. This is an original splash page from Superman 303 (cover dated September 1976) from the story, When Lightning Strikes... Maggin and drawn by Curt Swan with inks by the equally talented Bob Oksner. In this story the villain Whirlicane attacks Superman, yet again. Who is/was Whirlicane, you might ask? He was Emilo Storn, a bio-technician who was able to give himself the power to generate and control winds to hurricane strength. He first appeared in Action Comics 457 (Mar 1976) where he attempted to hi-jack a fuel train and then a jet-liner before being captured by Superman. As it works in comics, he was soon paroled into the custody of S. There, he developed a scheme to seek revenge on both Superman and S. Labs by using the android he had created. He called it Lightning, but it could transform into two deadly beings: Thunder and Lightning. Storn convinced Lightning that he was really a human criminal that Storn had given super powers to. Unfortunately, when Lightning discovered that he was a robot, he went insane (which is a very human trait, not a robots) and ran amok ultimately destroying himself, Storn's lab and apparently killing Storn too as that was the last appearance of Whirlicane. 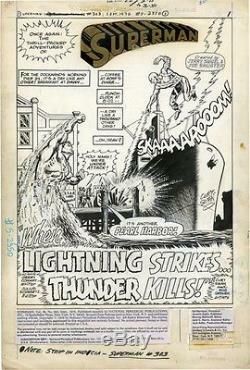 This splash shows Superman flying out of the water to stop Lightning from destroying a S. It is a true splash... One large dynamic panel not a multi-panel page or a "splashy panel". You get the classic word balloon, Holy Mama! The 70's were so weird. The page is 40 years old and, as you can see from the scan, shows signs of the DC production group (indicia, stats, logos and editorial markings) and age. The bottom left corner does have some "dings". The page is also signed by Swan in the lower right of the image. Here is a great opportunity to get a very nice, and reasonably priced example of Curt Swan's work on Superman... Which would look great framed and hanging on a wall. So jump all over this one. FREE scheduling, supersized images and templates. The item "Curt Swan & Bob Oksner Superman 303 pg 1 Splash" is in sale since Wednesday, March 08, 2017. This item is in the category "Collectibles\Comics\Original Comic Art\Splash Pages". The seller is "wwh27539" and is located in Cary, North Carolina. This item can be shipped worldwide.